I think about cookies often. Mostly crisp-edged, buttery, chocolate-chippy cookies, but sometimes I think about soft, chewy, sugary cookies, too. Not much beats a warm cookie (or two) washed down with a glass of cold milk. Or even a room-temperature cookie eaten slowly over the kitchen sink while you think about what to make for dinner. (Ahem. Who made the rule that says that dessert goes after dinner, anyway?) I guess you could say I think cookies, chocolate-chipped and otherwise, are the bees knees. That’s why when my sister, Emily, told me she wanted to bake something involving peanut butter and white chocolate, I thought it best to try making peanut butter and white chocolate chip cookies. 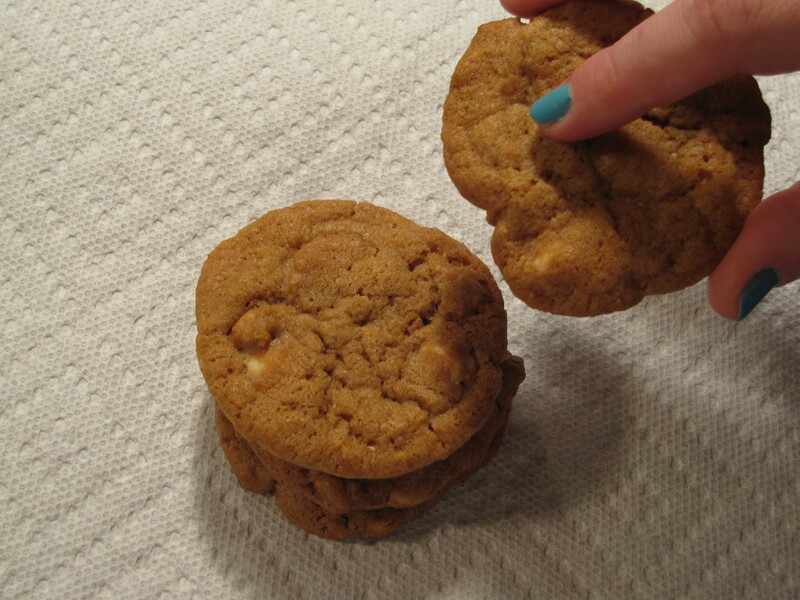 So, we gathered the ingredients and made peanut butter and white chocolate chip cookies, and it was definitively best. Not bad, huh? I mean, they’re probably not the prettiest cookies you’ve ever seen, but they taste delicious. (I know because I had to try one to make sure they were safe to bring to the Ronald McDonald house. They are.) Hopefully these cookies will brighten someone’s day. Cookies for charity are wonderful, but so are cookies for me, so I’ll get back to the peanut butter white chocolate chips. I’ll just get straight to the recipe, because I know you have cookies on the brain. At least, I do. PS: the nails in the pictures below belong to Emily. I’m not sure I could pull off blue nail polish, but, like everything else, it works on her. N’est pas? To make these little pretties, Emily and I experimented with a simple chocolate chip cookie recipe, adding white chocolate and peanut butter chips instead of the regular chocolate. We thought about adding peanut butter swirls or a dash of cinnamon, but in the end decided that, when it comes to chippy cookies, simple is best. Just butter, flour, sugar, salt, baking soda and powder, eggs and vanilla. And chips, of course. In this case, peanut butter and white chocolate. These come out slightly crunchy, with a deep, buttery sweet, almost caramel-like flavor that makes you want to take a full stack of these guys and act slightly indecently. Don’t say I didn’t warn you. * We only used vanilla sugar because my mother got it as a gift and it was sitting in the pantry, waiting to be turned into a cookie. Feel free to use regular granulated sugar instead. Preheat the oven to 350 degrees. Line a few baking sheets with parchment paper. Put the butter, granulated sugar, and light brown sugar in the bowl of an electric mixer and cream the ingredients on high speed. Don’t forget to scrape down the sides of the bowl with a rubber spatula to fully incorporate. Add the vanilla and egg and mix on medium speed. Add the flour mixture and mix on low speed just until batter is stiff and dough-like. 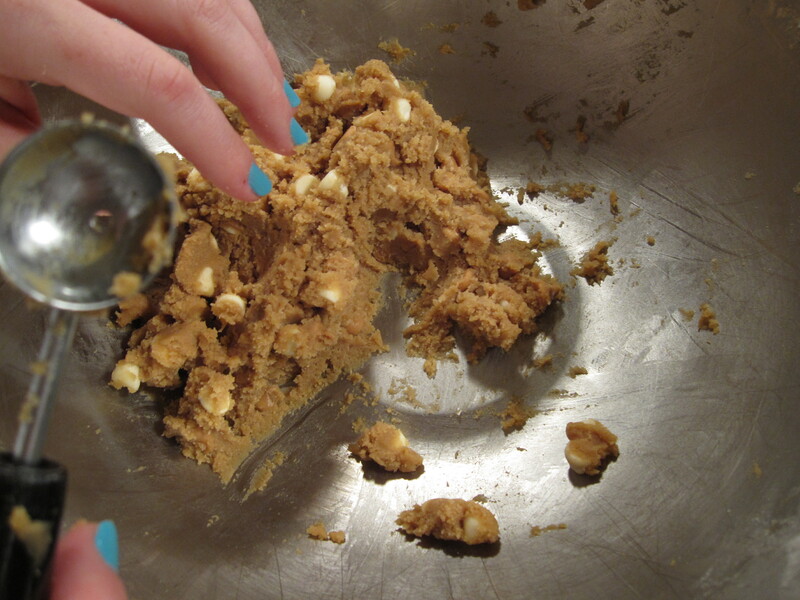 Turn off the mixer and, using a large spoon or plastic spatula, fold in the chocolate and peanut butter chips. Using a melon baller or small spoon, scoop heaping spoonfuls of the dough onto the baking sheet. Repeat with remaining dough, keeping about 2 inches between scoops. (You should get about 9 cookies on each sheet.) Bake until fragrant and golden brown, about 15-20 minutes. Let the cookies cool before devouring them indecently. 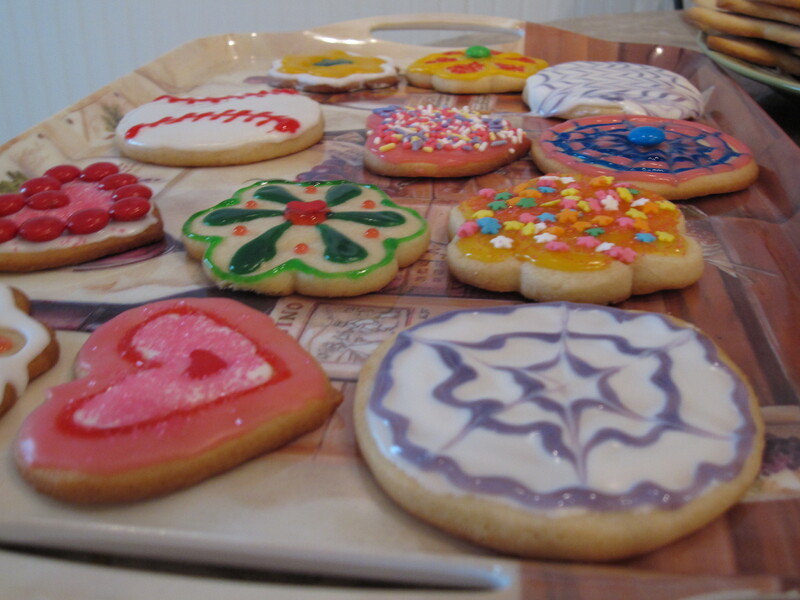 Molly, your Drop In & Decorate cookies are beautiful! I think Maris picked up a few pointers when she came to my event last week! Thank you so much for decorating cookies; I can only imagine how excited everyone was at Ronald McDonald House. Thank you, Lydia! I'm so glad I could be a part of Drop In & Decorate! I think your cookies look great! I’m so glad to see more people catching the “Drop In and Decorate” bug!! Great cookies; I especially like the baseball. Thanks for hosting a great Drop In. Well, I guess that you were lucky enough to inherit the cookie gene. Congratulations! Oh, I might have eaten one or two (or three or four) of that stack of white chocolate and peanut butter chip cookies that you left at home. And they were amazing! Your cookies look wonderful and I am sure you put many a smile on the recipient’s faces!